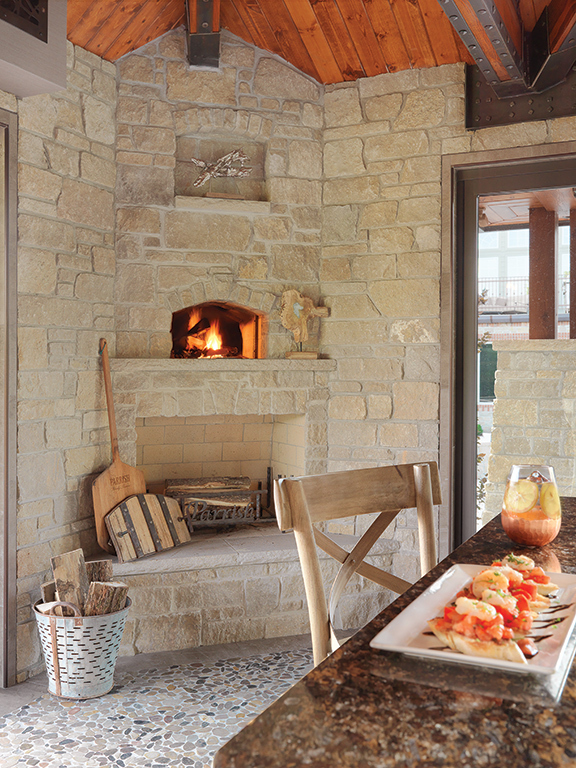 Relaxing at this Weldon Spring pool house is like taking a trip to a rustic retreat. When you step foot into Jeff and Reagan Parrish’s back yard, you are transported out of the local landscape and into a family-friendly, lodge-like oasis. Natural stone steps on either side of a man-made stream lead to a picturesque pool, which serves as the backdrop for a two-story pool house that has become a hometown hideaway for the avid entertainers and their growing brood. 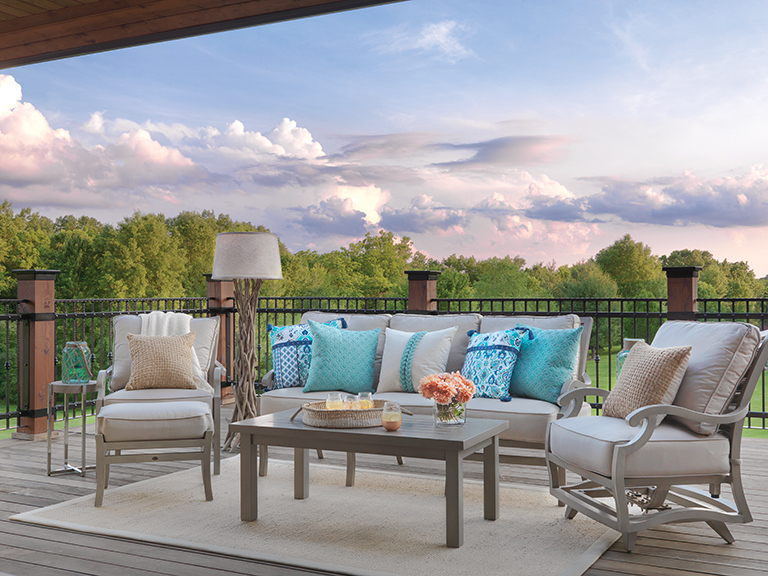 With convenience and functionality in mind, the homeowners teamed up with Lori Olsen McElvain of Castle Design to create the 1,664-square-foot alfresco retreat. “We wanted a space that would allow us and our guests to enjoy the outdoors and have access to the amenities that you would usually find indoors,” says Jeff. Massive folding glass doors span the width of three of the pool house’s four sides, extending the social hotspot’s usability to seasons far beyond summer while showcasing the details and comforts inside. The other wall makes just as grand of a statement with a kitchen perfect for a master chef, which is fitting, as Jeff is the owner of Quintessential Dining and Night Life. 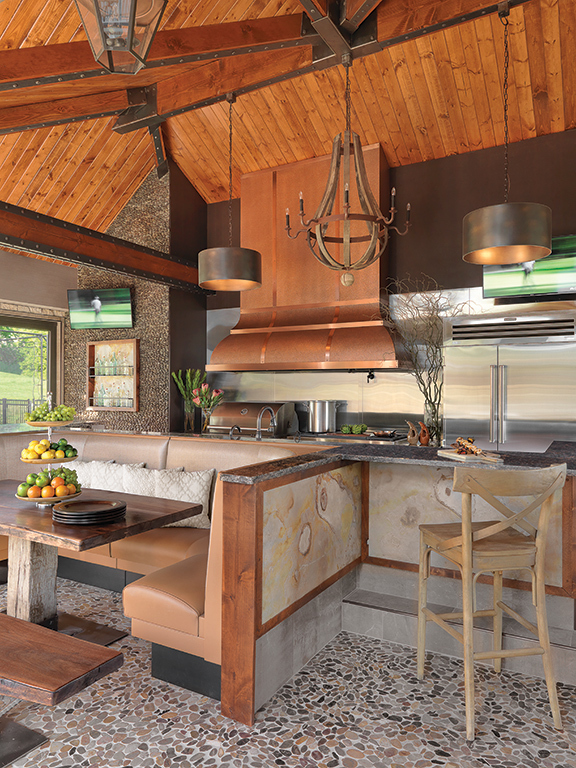 An outdoor grill, a must-have for the food-loving family, sits underneath a 110-inch copper mantel hood that was exclusively designed for the space. A wood-fire pizza oven, flattop griddle and spacious refrigerator help to make the sophisticated sanctuary feel like a true extension of the Parrish’s home. 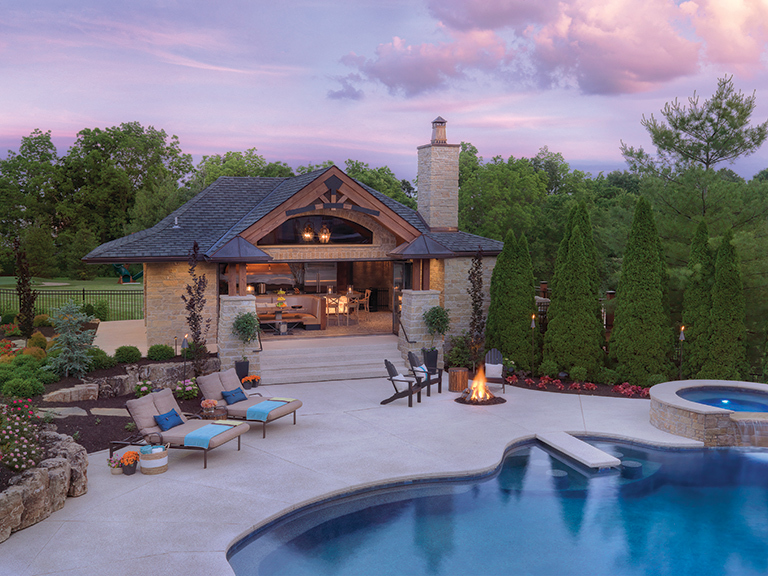 “The custom metal and woodwork by Next Level Metal is what really gives the pool house a unique, rustic edge,” mentions Lori. Solid Douglas Fur ceiling rafters are accented with handmade steel rivets to complement the casual light fixtures, including a wine barrel stave chandelier, that shine light on the versatile seating and bar area. A dining table made from reclaimed wood pairs effortlessly with a weather-resistant, restaurant-style booth, which stands up to post-swimming snacking. “We added a 120-inch movie screen to one of the residence's basement windows, so it was challenging to figure out how to incorporate ample seating into the upper level of the pool house while being careful to not obstruct anyone’s view,” Lori explains. Pebble and stone playfully cover the floors and walls, while slate and speckled-gray granite make an appearance on the bar, helping the cozy cabin-inspired space to be resilient to wear and tear. A steel, spiral staircase, clad in artful metal flourishes, extends past a stunning bathroom and deck into the lower level, which boasts a movie theater, wine cellar and additional room for storage and hosting friends and family. "There’s nothing more comfortable than being at home, so why not have your own back yard be your favorite travel destination,” laughs Jeff. Mixing neutral colors, masculine metals and a laid-back design style, hanging out at the Parrish pool house is the epitome of a sublime staycation.